More about the software at this Microsoft Live Labs site. The demo clearly blew the audience away (myself included, 'cos I couldn't help grinning as I watched the demo unfold). I liked how the demonstrated technology allowed the user to give a very high-level overview of thumbnail images (very much like how we can look at several book cover on a shelf, for instance) and then effortlessly zoom to very minute level -- good enough to read the scanned page like a book. The other part of the demo showed how the technology collated individual Flickr images of the Notre Dame to build a "multi-dimensional" zoom-able view of the structure. You have to watch the video to see what I mean. The social-media, educational and cultural aspects of such an application is just fantastic. The speaker, Blaise Aguera y Arcas, said as much near the end of his presentation. About building "Collective Memories". I can imagine how it would work. Let's say you visit a nature reserve. You snap a few pictures. A tree, a frond, a monkey in a tree. Not from a researcher's point of view. Merely that you felt it was a "Kodak moment". Later, you upload one or two images to a photo-sharing site. It's just one or two photos from you. Nothing particularly fantastic. If I happen to come across what you've uploaded, I see a 2-D view of your snapshots. I might look at other similar photos from others (perhaps with similar tags) but that's about it. They are merely individual pictures. Then let's say the software and technology is made widely available for use (Open Source, or freeware -- one does hope). Someone (with some free time, perhaps) constructs a multi-dimensional view using the photos of the nature reserve. Maybe even videos. I'd imagine the content having been deposited under the Creative Commons license, so there's no copyright clearance hassle. Now the individual and separate pictures (and videos) begin to form a wider view of things. A bigger story is presented. When you uploaded your photo of that monkey in a tree, it didn't really say much, from a scientific point of view. But suppose a researcher views the multidimensional construct and is able to tell and later track the location of certain species. Or the student who is doing a project on conservation, and is able to relate a recent field trip, or information read from a book or Internet resource, to the multidimensional view. And other people could then add to this multidimensional view and build a picture over time. Those who make further contributions don't really have to know how or why. To them, they are just adding one more photo. But the software could automatically add to the view. It's even possible to track missing persons (or track a person). Well, naturally the implications for individual privacy also widens. I'm reminded of a SciFi story published by Asimov -- The Green Leopard Plague by Walter Jon Williams (you can read the online version here). In the story, the protagonist was hired to track down a person. She eventually identified his location after looking at clues from images and video that have been uploaded in electronic formats (BTW, the whole story isn't about the technology per se. It's a lot more than that and worth a read). Well, looks like Walter J. Williams was spot on. I don't know Paddy Tan personally. I heard about him when Kevin posted this video interview in Oct '07. Only recently did I have a chance to email him. Well, if you consider a short note in a mailing list to say "Congrats". I'd learned he's one of Businessweek's nominee for Asia's Young Entrepreneurs. You can find out more about Paddy, where he shares his secrets to success (via entrepreneur.com.sg) , and the story behind his starting of his business (via sgentrepreneurs.com). Paddy has a blog at tomato75.blogspot.com. In the email list, Paddy shared that at 32 years old, he seemed to be the oldest nominee. Voting for nominees is at this page. I mean, back to work. Oh, Vienna was real alright. Just that when you're a stranger in a strange land, things just feel different. Learned from a google alert I set up that Mr. Miyagi's blogge about using the library's enquiry service again. He viewed the service as a "great resource of last resort" and suggests that users "Google first" before bothering the librarian. Heh. Oh, I've got an email from a librarian from the Neatherlands! Jaap van de Geer, who works for DOK, Delft Public Library. He read that I was visiting Vienna and asked if I could make a detour to Amsterdam to visit Delft. Got his message too late though. Anyway, he mentioned how they are trying to get ideas to build a new library. He and two other colleagues (Erik Boekesteijn and Geert van Boogaard) completed a road trip in the USA last month, in search of best practices and innovation within libraries. Results of that tour at www.shanachietour.com. Interesting! I've sent a quick reply to him. Will watch the videos at the site later (they edited it on the fly, according to Jaap). 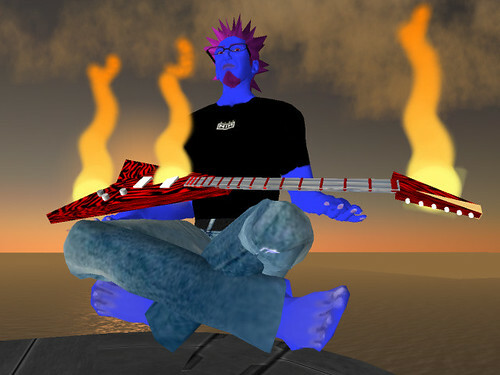 I'll have to find time to complete the SeaStars music album with Adrian. By December. Incidentally, this music video will be screened at the inaugural Songcraft Year-end Concert next month. 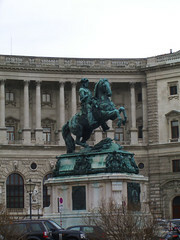 And in between, I'll have to blog more about Vienna. I don't know how to adequately describe Vienna. The Travel Guides do a better job. 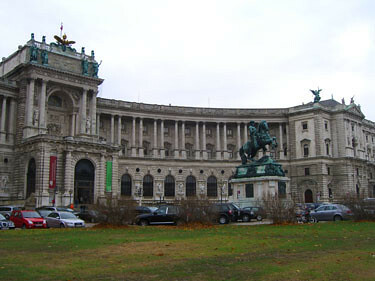 But I'll certainly be blogging about the visits to the Central Public Library in Vienna (Buechereien Wien), and a visit to the United Nations building (the library of the International Atomic Energy Agency (IAEA), to be exact. BTW, guess how many photos I took? One thousand, three hundred and forty-seven. 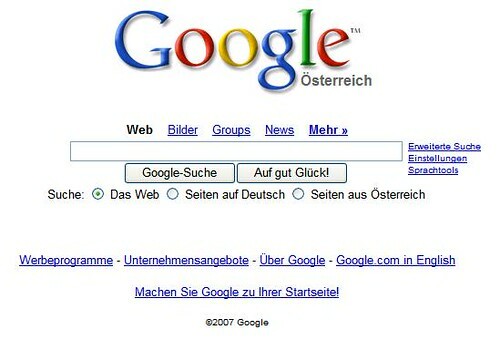 You know you're in Austria when you type in "google.com" and you're automatically redirected to "google.at". 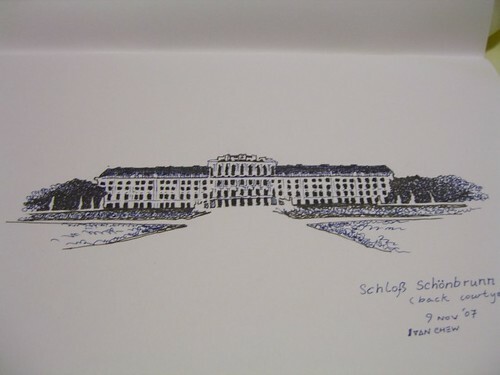 It's Saturday 10 November, 10.52pm in Vienna, as I blog this (six hours behind Singapore). Using my wife's laptop, via the free Internet access in the hotel room (not all hotels offer free Internet access though). Been a good learning experience so far. Walked alot. Got lost alot (I guess that's how one learn sometimes, though my wife would grumble at me for not asking for directions). Today my wife and I stumbled quite unexpectedly to the Austrian National Library (to my non-librarian readers, it's a National Library like this one, not a Public Library). 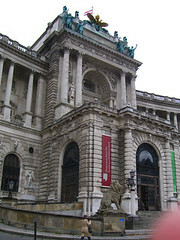 We knew the Austrian National Library (Österreichische Nationalbibliothek) was in the city area but we weren't really looking for it. We more or less stumbled onto it, so we decided to pop in to have a look. It looks very grand from far away. I couldn't help but imagine -- in an alternate universe, where statues would come to life, if you've been tardy in paying your library fines (assuming you could borrow things from the National Library), they'll send this imposing horseman to your house! And if that's not enough, there will be these mean looking warriors accompanying the horseman. "Excuse me sir, are you sure you've paid your fines? Try explaining to my trusty broadsword!". You walk up the steps and you next face this grand entrance that's well over four metres (of course the door that you actually open is the standard two metres or so). 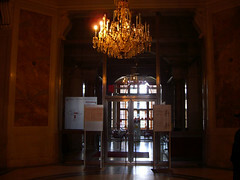 The foyer area is also very grand looking. Ah, I quickly learned that the Austrian National Library doesn't open on weekends (maybe I've been too used to our own National and Public library opening hours). So I snapped a shot of the member's reading room from outside the sliding door. Notice the "No Dogs Allowed" sign? (first one from the left). In Austria (like in Germany), people bring their pet dogs with them when they go shopping. It's not surprsing to see dogs and their owners in restuarants and shopping districts. 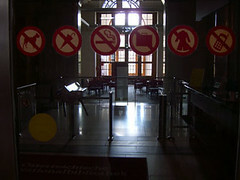 The "No Smoking" sign may seem odd to Singaporeans too (third one from the left). But in Austria, the norm is to be able to smoke in buildings, restuarants etc. For a non-smoker like me, it's not an enjoyable experience dining in a place with second-hand smoke as an ingredient. So far, my wife and I are enjoying Vienna even though it's been cold (between 2 to 6 degrees Celsius) and wet. Been drizzling. Good thing we were prepared for the weather. Today's our third day in Vienna. We've been to some of the cultural attractions (the names are lost to me... will check/ blog later). Paid quite a sum in entrance fees too. Speaking of expensive, seems that most of the public toilets here costs money to use -- 50 cents (Euros). That's about SGD$1.20 just to pee. Darn expensive pee. The next time I use a public toilet in Singapore, I'd be more appreciative that I hardly have to pay for using most of them. Overall verdict so far: Vienna's nice. It's safer and more tourist-friendly than I expected. I'll be going off for a two-week vacation in Vienna. Yeah. Where the Danube river flows and inspired Strauss to compose one of his masterpiece (at least the part that flows through Austria, I think). But I certainly don't feel free, and my mind isn't empty of work. At least not now. The irony (to me) was that in trying to prepare for my vacation, I'm spending more time doing work now, so that I can clear as much as I can before I go for my break. I suppose it's necessary to give me a greater peace of mind, if I know that I've done my share of the work. And that my colleagues aren't cursing and swearing in my absence, for having to do my share, heh. Anyway, part of this "lack of peace of mind" was because I was totally clueless about Vienna. So I did what I usually do when preparing to travel. The Travel Guides section, to be specific. Now, it's not that I don't check the Internet. In fact, it was the first thing I did (let's face it -- Google's just at my finger tips, and I'm facing the computer most of the time, than wandering among the library shelves). But there's always a point where I want to check what's in print as well. It's not that the Internet resource isn't reliable or credible (they are, and more updated than a printed edition sometimes). But somehow I find comfort in verifying the information in print. Plus I find useful information in print, that might not be presented the same way on the Internet site. For instance, this guidebook I found today -- "Wallpaper City Guide: Vienna (Wallpaper City Guide)"
It was in a handy pocketbook format. Plenty of pictures (more so than what I found at a single website). It suggested specifically on what one could do when exploring the city. There's a section "24 Hours: See the best of Vienna in just one day" that suggests on a few notable places to visit. Shows the insides of restaurants; there's a "Architour" section showing some of Vienna's iconic buildings (all modern architecture). The "Essential Information" segment (2 pages) provided useful addresses and telephone numbers. I like how they provided a short "Cost Of Living" segment, on transport costs (airport to city centre is 40 euros), a cappuccino (2.90 euros), daily newspaper (1.20 euros). Gives one a benchmark on how much things would cost there. This particular guide covers shopping tips (come to think of it, almost all travel guidebooks never fail to include shopping). I decided not to borrow the guidebook though. I learned from two other guidebooks (I may blog about them if there's time) about the Vienna Woods. That interested me more than shopping. So this guidebook didn't mention how to get to the Vienna woods and the Danube river. Overall this guide seems to cater more for the up-market travellers rather than those on a budget. Unfortunately this guide doesn't indicate when it was published. So I'll borrow some other guidebook instead. Still, having browsed this one gave me a better idea of what I might not want to do, so that I'm more focused when planning my itinerary. My vacation starts on the 7th. But maybe I should borrow another sort of book. A book that teaches one how to empty one's mind. I don’t “Shhh!” for a living. Although I wish I did. That would be the easiest job in the world. Shushing people. Index finger to lips. Pucker and Shhh! Get paid. Easy-peasy. But it's a good thing I don't. For one, wrinkles form more easily if one puckers the lips too much (guys are a little concerned about looks too!). Two, it'll be a boring and meaningless excuse for a job. For me, librarianship (public librarianship, to be specific) is a calling. Not in the religious sense but closer to a philosophically of why we do what we do. Customer (you read; you have to; enough said). See? I wish I'd only Shhhed people for a living. With so many things to do, why did I stick with being a librarian for the last 11 years? Because in simple terms, I think I'm contributing some good to society. It's a nice feeling. Better than pursing one's lips. Call for library@orchard Citizen Reporters answered! 30 Oct 2007. Just five minutes to 7.30pm. "Would anyone turn up?" I wondered, as I made my way to the library@orchard to conduct the briefing. At 7.30pm, eight of them turned up punctually. I thought, "Only eight? That's all the library could garner? I thought we'd get more people." As much as I'm ashamed to say it now, I was disappointed. After the hours spent planning, obtaining permission and convincing senior management why we should do something like this... Eight people? I said I'm ashamed of myself, because all eight of them were clearly passionate about library@orchard. And they generously gave their time to attend this briefing. That they agreed to sign up in the end was a bonus. So thank you folks, from the bottom of my heart. My colleague, Jillian, shares her perspective of the briefing, here. As we promised, it was a truly brief Briefing. Before the session began, we asked the participants to write their names and blog URL on the white board. The scribblings below were mine -- I asked them how they learned about the call for citizen reporters. The third and fourth person went to the www.nlb.gov.sg site and found their way to the library@orchard blog post. One of them told another friend (who became the fifth person). As I left the library@orchard after the briefing, I felt truly humbled. It may seem like a small thing to some people. "It's just a handful of people who agree to blog about the library. So what?" Well, these handful were generous enough to give their time. And I sensed from many -- if not all -- that they were genuinely passionate about the library. They expressed a sense of belonging with library@orchard. It's fitting that it's now the Singapore Library Week, with the tagline "Get inspired at your library". I'm inspired by those eight people who answered the call. 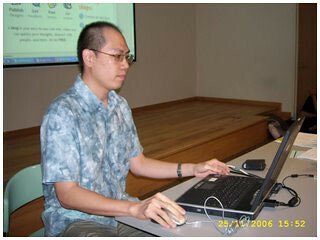 This event was launch today -- Singapore Library Week 2007. Singapore, 1 November 2007 – More than 40 academic, public and special libraries across the island have joined the National Library Board (NLB) and Library Association of Singapore (LAS) during Singapore Library Week (1-9 November) to celebrate the valuable contributions of our libraries and librarians over the past 50 years. Singapore Library Week marks the 50th anniversary of the Raffles National Library Ordinance in 1957 that allowed for free public access to libraries in Singapore. Guest of Honour, Dr Lee Boon Yang, Minister for Information, Communications and the Arts, launched the Singapore Library Week festivities at The Plaza, National Library building this morning, in the presence of over 300 guests. To commemorate the 50th Anniversary of the Raffles National Library Ordinance that made public access to libraries possible, a book called, ‘The People’s Library – 50 years of National and Public Library Services’ has been produced by NLB. The book includes a special poem penned by Emeritus Professor Edwin Thumboo, who dedicated it to Mrs Hedwig Anuar, the first Singaporean director of the National Library (1965-1988) and another new poem to the National Library written this year. In keeping with the theme of ‘Get Inspired @ your library’, close to 400 student-participants and librarians got the chance to listen to internationally acclaimed computer graphics wizard Nickson Fong, who worked on Hollywood blockbusters such as ‘Matrix’. He and a panel of speakers shared about the inspirations behind their dreams and achievements and how the library played a part in nurturing their aspirations. 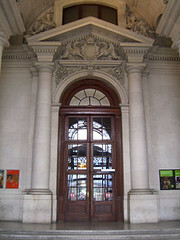 Fourteen libraries are participating in the celebrations with several libraries holding tours, open houses, and exhibitions. The following organisations will be holding events: Nanyang Technological University, National Institute of Education, National University of Singapore, Nanyang Polytechnic, Ngee Ann Polytechnic, Republic Polytechnic, Singapore Polytechnic, Temasek Polytechnic, Institute of Southeast Asian Studies, Laselle College of the Arts, KK Women’s and Children’s Hospital, and Social Service Training Institute Resource Centre. Please refer to the SLW brochure or website www.singaporelibraryweek.sg for more information. 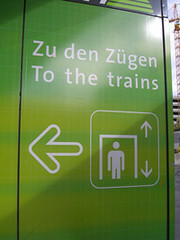 The promotion begins on 1 November and will run till 31 January 2008. NLB encourages you to double up on your reading – basic members can borrow up to 8 items and premium members up to 16 items. During Singapore Library Week, NLB will offer prizes to the 50 people who are nearest to the millionth library loan mark. Prizes include complimentary Premium membership for 5 years for these lucky 50. The person that holds the millionth loan honour will receive, in addition to the 5-year complimentary Premium membership, the newly-launched Nokia 5310 mobile phone.